NATIONAL PARK: "POETRY IN STONE"
"Bryce Canyon's serene vistas are deceptive; the landscape is never static . . .
the forces of weathering and erosion never rest, not even for a day. This dynamic, mesmerizing place is like no other." Even though both Jim and I have been to Bryce Canyon previously, it had been decades -- at least 30 years for Jim, and my most recent park brochure was dated 1996. That tiny map just shows the general layout of the park. I highlighted the main park road in yellow. You can enlarge this map so you can actually read it -- and see a more detailed map of the entrance area -- at this park link. Bryce is definitely mesmerizing and I spent as much time hiking and sight-seeing there as possible during our month-long stay in the area this fall. We like the area so much we returned again for a month in May, 2016 and even longer during autumn, 2016. The cliffs and rock formations in each place we've visited in southern Utah's canyon country have been unique. The geology of Bryce Canyon is similar to that of Red Canyon but the multi-hued rock formations at Bryce are more pastel than vivid and the scale is much grander. I like both canyons for different reasons. 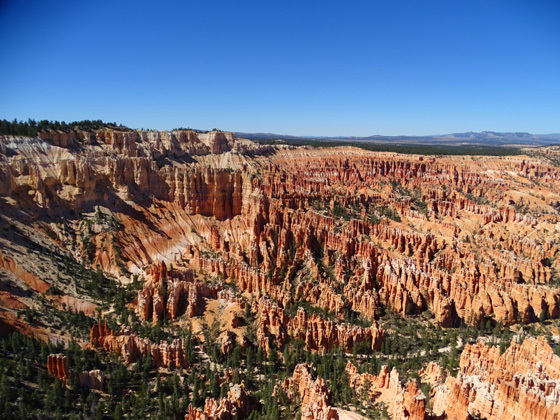 This entry and the next one are overviews with lots of general information about visiting Bryce Canyon National Park. They include photos I took during September and October from the overlooks, Rim Trail, visitor center, lodge, and new multi-use path. I'll have additional entries with lots more pictures from the trails down into the canyon. I hiked most of the 65 miles of trail in the park during this visit and we both took a half day horse ride through the heart of the amphitheater. 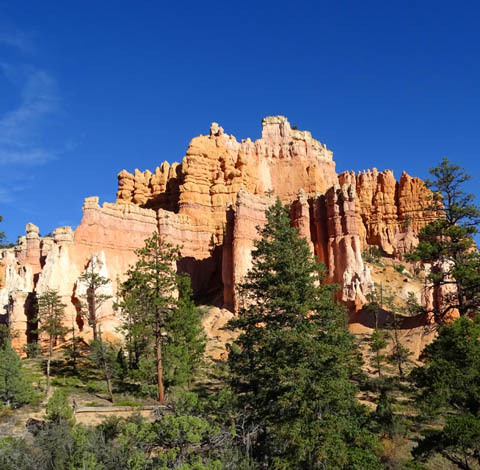 This fall has been warmer than average and the crowds at Bryce Canyon haven't abated much since the busy summer season, per rangers I've talked with. Bryce doesn't get as many visitors as Zion National Park, located less than a two-hour drive to the southwest, but the volume of traffic, packed parking areas, and number of people at the visitor center, lodge, and overlooks at Bryce from September 17 to October 17 took us by surprise. 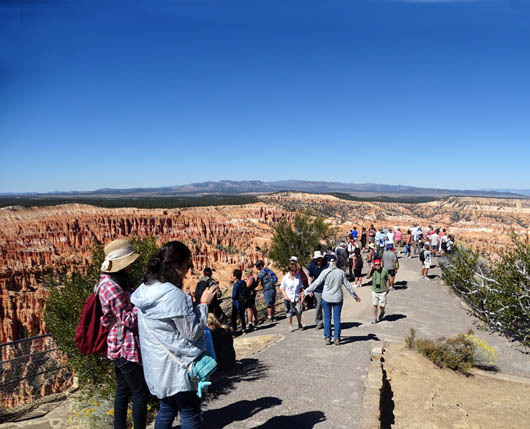 By the end of 2015 the official visitor count at Bryce was 1.7 million people. Most of them come to the park in the six months from May to October. Do the math . . . It was even worse (for visitors, not the National Park Service!) 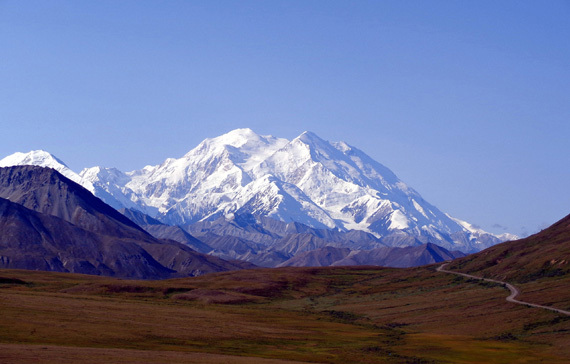 in 2016, the centennial celebration of the NPS. Yes, I do realize that Jim and I added to the crowd both years. 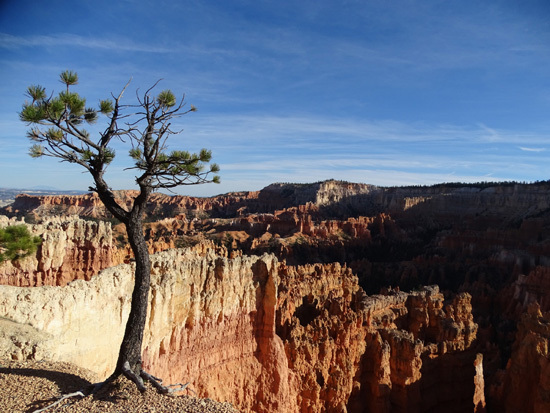 Bryce Canyon is open all year long, although not all the trails and services are open during the colder winter months. Photos of snow on the colorful rocks are beautiful so even a winter visit is spectacular. Fall is a popular time for retirees and foreigners to visit the park. We didn't see very many school-age kids during our current visit. 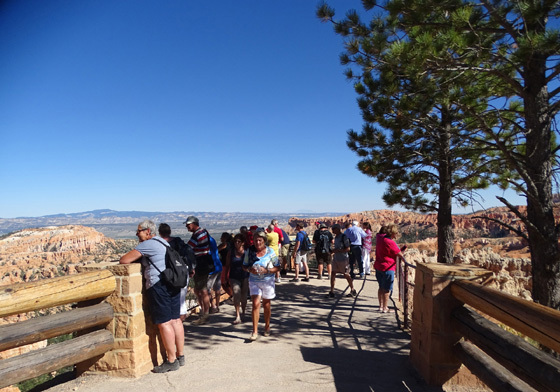 We did hear many different languages and saw numerous large tour buses bringing folks from all over the world to see Bryce Canyon for a few hours. 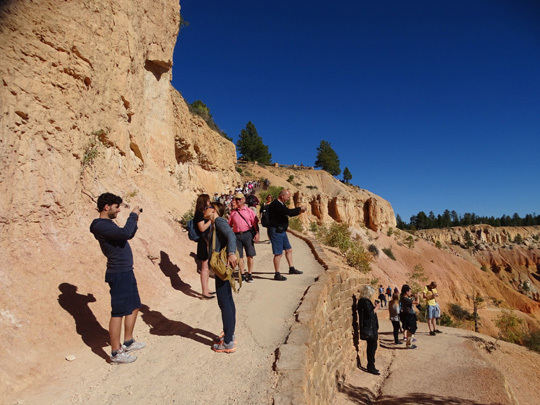 Visitors enjoy the views in three directions into the canyon at Sunset Point Overlook. It is possible to see down into the canyon all along the plateau rim for 18 miles in several hours, as long as you can find parking spots at the busy overlooks above the main amphitheater near the park entrance. 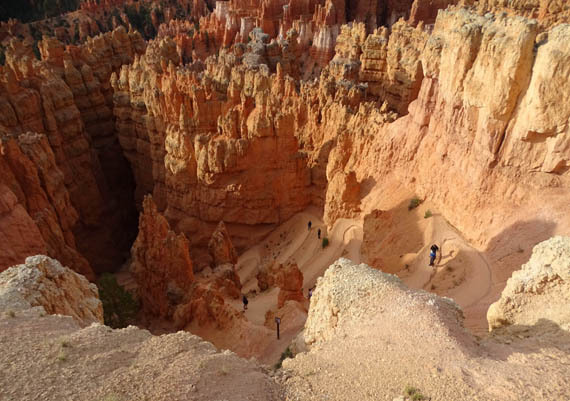 To get a real feel for the majesty of the hoodoos and other rock formations, however, you need to allow time to hike down into the canyon on one or more trails. As in Red Canyon, the more time you can spend here, the more you'll appreciate how special a place it is. Check the park website, brochure, and newspaper guide for the park map, entry fees, and dates/hours of operation for the campgrounds, lodge, cabins, shuttle buses, etc. We got in free because we have National Park Service senior passes. Shuttle buses are free to everyone if you want to use them (we never did). 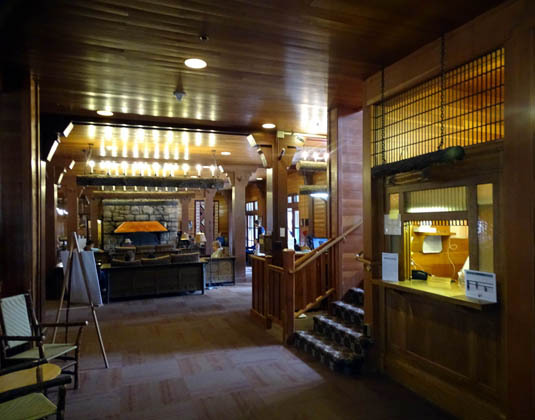 The exhibits and park video in the visitor center, interpretive talks, and ranger-led hikes are also free. You'll have to pay for food, gifts, camping, lodging, guided horseback tours, etc. During the spring, summer, and fall free shuttle buses operate from Bryce Canyon City a couple miles from the park entrance. Buses run through the first three miles of the park where the most popular overlooks and facilities are located. The buses don't operate on what they call the Southern Scenic Drive between Bryce Point and Rainbow/Yovimpa Points in the southern part of the park, however. You have to provide your own transportation to reach those overlooks. Unlike Zion National Park, visitors can still drive their own vehicles along the entire 18-mile park road. Just beware that popular parking areas fill up by mid-morning, even on rare rainy days. Because of the crowds I quickly learned I needed to get to trailhead parking areas at Fairyland, Sunrise, Sunset, Inspiration, or Bryce Points before 8 AM to be assured of finding a parking place. No one was manning the entrance gates before 8, to my surprise. The longest lines at the gate seemed to be from 9-11 AM, when vehicles could be backed up for half a mile to get in. By mid-afternoon it was usually easier to get a parking spot anywhere in the park. Elevations in the park range from about 6,600 feet at the lowest point in the canyon to 9,100+ feet at Rainbow Point. It's about 8,000 feet elevation at the popular overlooks near the entrance. Most visitors aren't used to these high desert elevations so pace yourself when hiking. Remember that if you go down any of the trails . . . you have to come back up! Another hazard in the park is all the steep cliffs. The Rim Trail goes quite close to many steep drop-offs so be careful walking there. It's a long way down if you slip over the edge of the rim! This spot is near Sunset Point. 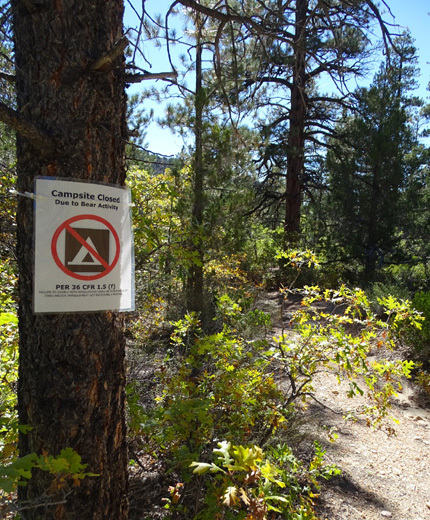 Pets are allowed at overlooks, in the two campgrounds, and on paved roads and trails (all of the bike path, and the Rim Trail between Sunrise and Sunset Points) but not on any unpaved trail or in buildings unless they are service dogs. That's standard for most U.S. national parks. It's easy to spot birds, mule deer, pronghorn, chipmunks, and ground squirrels on the rim and canyon trails. I didn't see any of the resident rattlesnakes, even on warm, sunny afternoons down in the wilderness part of the canyon. In the fall visitors can enjoy yellow aspen leaves and orange/red oak leaves on shrubs. Pinion pine and juniper grow among the hoodoos at the lower elevations. Ponderosa pine, bristlecone pine, fir, and aspen thrive at higher elevations in the park. Some colorful wildflowers were still in bloom during this visit, including yellow rabbitbrush and purple asters. 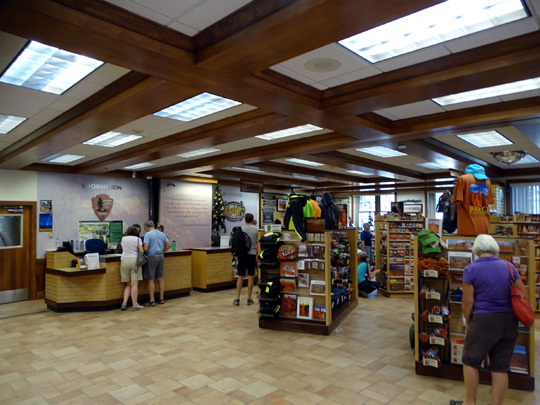 If you've never been to a particular national park recently it's a good idea to stop in the visitor center upon your arrival. Bryce's visitor center is located right inside the entrance gate. You can get a park brochure and "The Hoodoo" newspaper guide at the entrance but there is much more information available in the visitor center -- rangers can answer questions and offer advice, you can watch the park video in the theater, you can see when ranger talks and walks are scheduled, you can browse the exhibits and items for sale, etc. 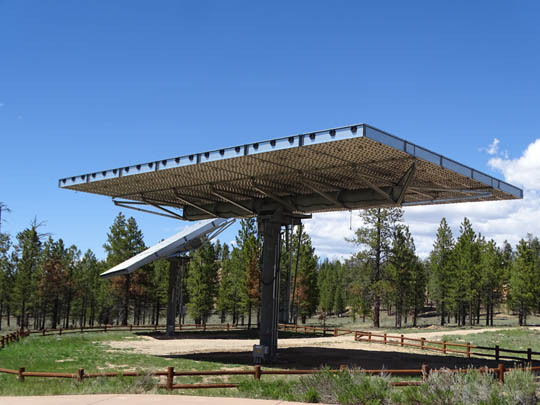 There is also a general store located in the extended parking area near Sunrise Point where visitors can purchase food items, ice, camping supplies, clothing, books, calendars, and various gifts. 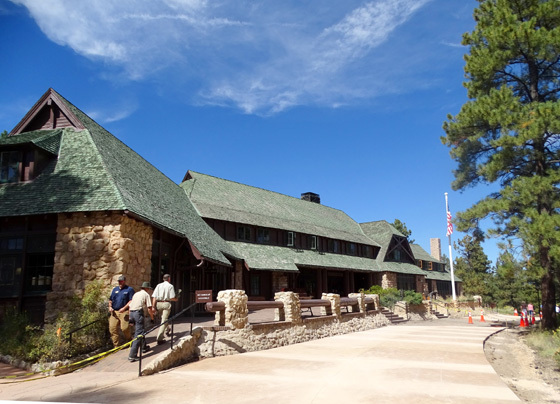 The Bryce Canyon Lodge is open late March to early November and includes a restaurant, meeting room, cabin, suites, and gift shop. We signed up there for our horseback ride and ate a tasty lunch in the dining room after that ride. This is one of the national park lodges designed by architect Gilbert Stanley Underwood. 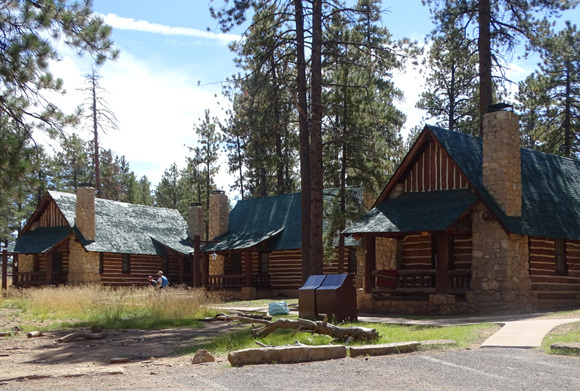 It was built in 1923, a decade before the CCC began constructing buildings at national parks, and is a National Historic Landmark. At Bryce Canyon Underwood designed buildings with a unique wavy pattern in the rooftops. 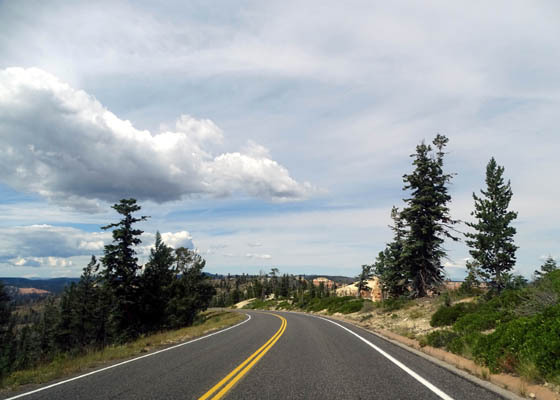 A very nice paved 6.2-mile shared use path from Bryce Canyon City to Inspiration Point was still a work in progress when we visited this fall. The path was graded but not all paved or landscaped. 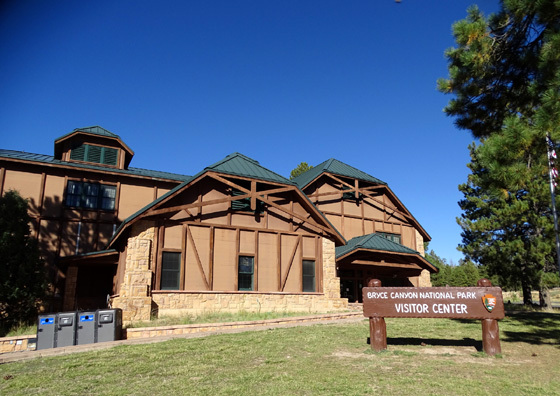 It connects to the bike path that starts at the lower end of Red Canyon and runs 15+ miles to Bryce Canyon City north of the park, giving runners, hikers, and cyclists 22+ miles of trail or up to 45 miles out and back. most of its six miles in the park are farther from the road than this. Jim was able to ride on the packed dirt over the part of the trail on Paunsaugunt Plateau and in the park that wasn't finished yet. He just got out on the road when crews were actually working on them. All the paving was done when we were here in May, 2016 so we both rode on the path. 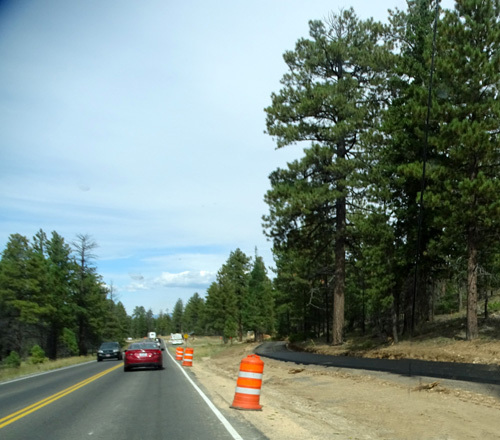 Crews were still doing some striping and landscaping here and there. By fall of 2016 the path was totally completed -- we love it! I'll show more photos in the 2016 journal.